Productivity and to do list apps must be one of the most crowded niches. There is a good gazillion of these apps on the app stores for all platforms, and new ones keep emerging with a regularity one can envy. The good ones are memorable while the excellent ones are widely adopted. However, if you are like me, you most likely would not mind a mid-range powerful to-do list app that maybe combines the features of a shopping list app for everyday chores and lists, or plans, but you still haven’t found that one that would make you want to keep it. 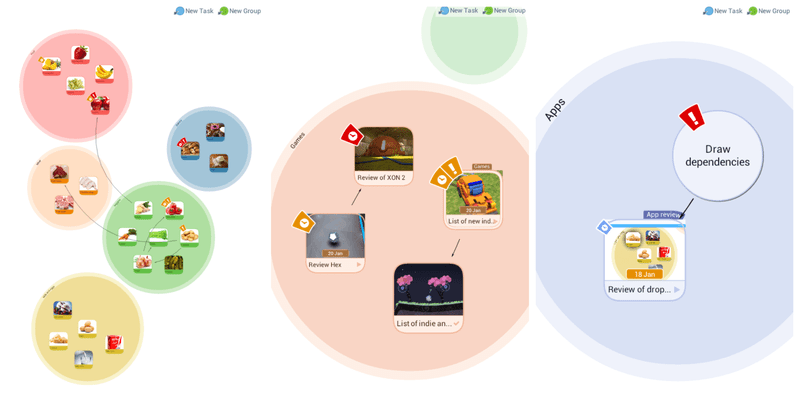 I have tried a lot of apps, and liked many, but none of them eventually made the cut – ultimately, I loathe linear lists, rows and cells, diagrams and all that clutter, or the lack of whereof that comes with these apps. Enter DropTask. It is not a new app, but it appeared on my radar with its December update, so I gave it a spin to get instantly hooked – THAT’s what I needed. 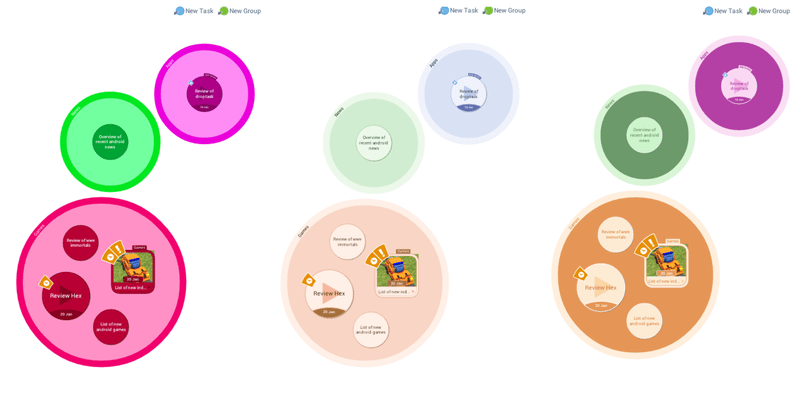 Yes, you can have a ‘List’ view of your tasks and lists, but the best selling point of the app is its ‘Visual’ view, where your projects and routines are visually neat circles on a white canvas. Those who perceive visual information better than the text-based data will immediately appreciate the app’s take on data management. 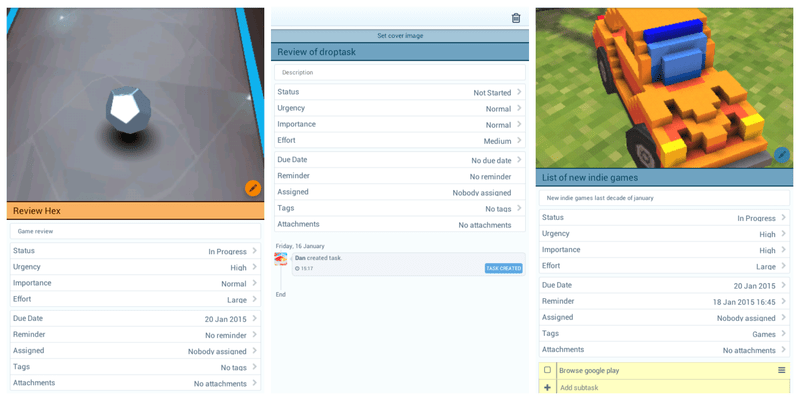 DropTask comes with a fully-fledged web service, Android app, standalone iPad and a separate iPhone apps. Mobile apps are free with basic functionality while paid plans are available with monthly and yearly fees starting at $6.50 per month. Whether you need a free or paid plan depends on your needs, but as far as individual users looking to manage their daily routines are concerned, the free app with basic features makes the cut. On the other hand, if you have a small team and need a project management tool, you may consider a $25/mo plan for 5 users. Let’s see what the app does. You need an account with DropTask, and you can register one from the app, or on their website. You can use your Google account if you need to tap into some of its data, or make an account solely fro DropTask. I will say it right away – creating lists is definitely easier in the web app from a desktop browser, where typing and editing, as well as dragging-and-dropping is faster than on any mobile device. However, a mobile app is convenient enough to create projects, too. There are three main elements you will be working with – Projects, Groups and Tasks. At first, create a Project and name it. Pro users will be able to pick from four visual themes (Default, Traditional, Business and Neon) that differ in the color schemes only – some smooth, some vivid; and three customizable Project templates, and create their own templates. The free account lets you create Projects from scratch, and the limit of projects you can have at a time in the app is five while the Pro upgrade removes that limit. 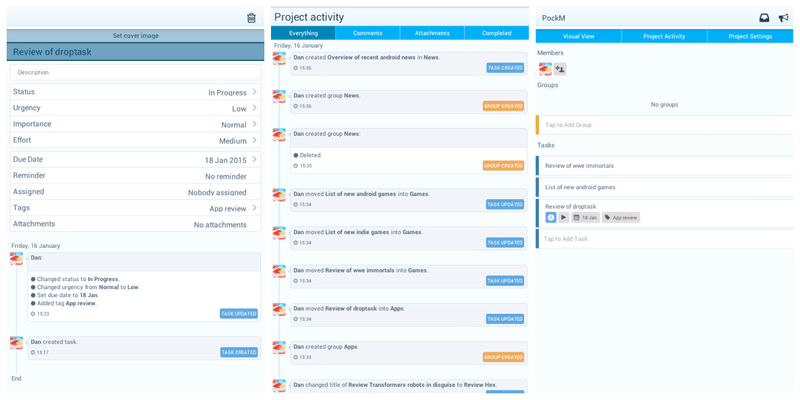 Inside the project, you can add Groups and Tasks, as well as sub-tasks. Pro users have unlimited sub-tasks, comments and attachments to their tasks. But let’s focus on the circles! Open the project in the visual view tab and see the white canvas. Then, tap on the Groups to add a big bubble to the canvas, and name it according to the group of tasks you would like to create. Next, tap on the Task and drag-and-drop the bubble that appeared into the Group bubble. Name the task, add details and look at your canvas again – looks neat, doesn’t it? 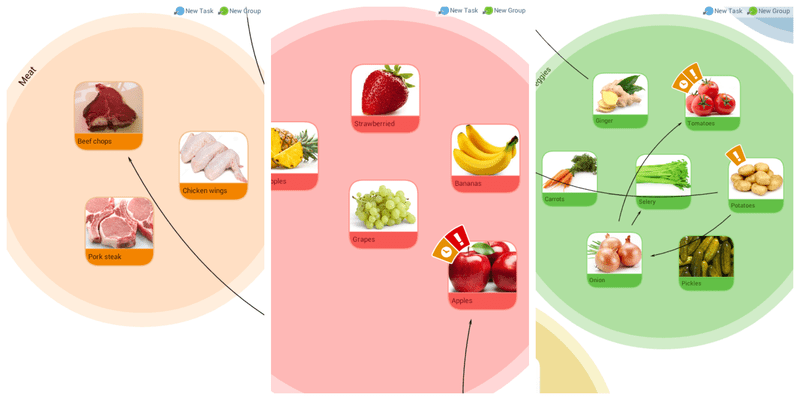 This visual view works perfect for shopping lists, travel plans, party preparations, work projects and gift ideas alike. 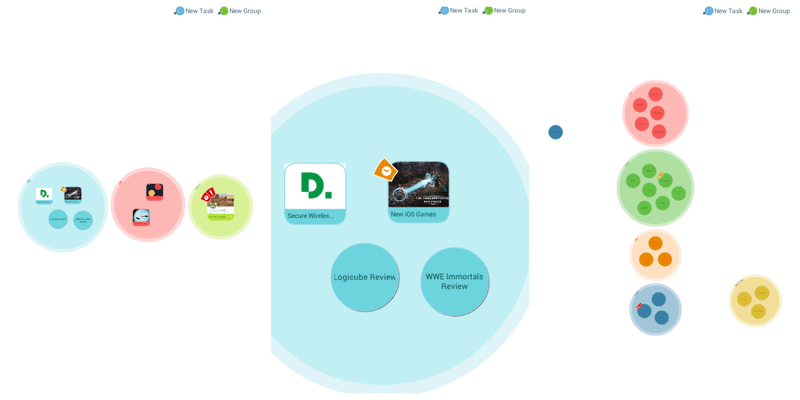 There is no limit to the instances DropTask can be used, provided you like the visual representation of the app. Of course, “with images” versus “no images” does make a difference, but without the images the font of the task titles is bigger. So, even though the ability to add featured images to tasks is a very neat one, I don’t see myself buying the Pro version just for the sake of images, without really needing the other features of the Pro plan, like drawing dependencies, inviting collaborators and attaching files. That said, featured images make a huge difference in how fast I perceive information. The free version adds Google Contacts integration, daily summary email and due dates notifications. The Pro version has a slew of other perks, like emailing tasks, copying and moving tasks, exporting projects in CSV, JSON, or IMX files, as well as integration with Google Tasks and Calendar. Another nifty feature is Dependencies, available in Pro version only. Dependencies are the arrows you see on screenshots. You can make a neat connection, or order dependencies among your Groups and Tasks. Too many make it a confusing picture while a few can make a productive difference. Synchronization is another strong point of DropTask that lets you work offline on your device, and once you reach a WiFi network, the app automatically synchronizes the changes and edits to your web account. Pro features focus on team work and collaboration perks, where the Admin of the Project can assign Tasks, limit members in permissions, view progress and changes they make to projects, attach documents, email from the app and more. Provided a team is made of “visual” type of people, DropTask is a deal breaker. 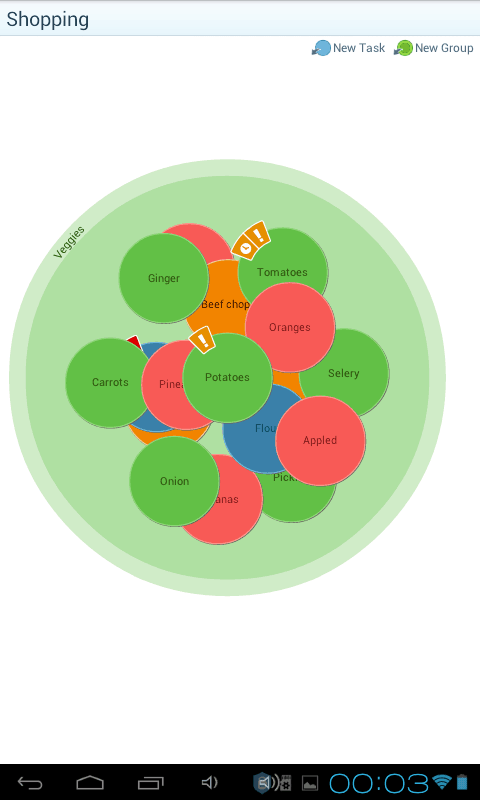 During my first day with DropTask, my Shopping project visual view would occasionally mess up into a mesh-mash of everything in one bubble. Force-stopping the app would solve it until the nag appeared again. After I’ve logged into the web app the next day, and compartmentalized everything a bit differently (it is pure fun on a large screen), added images to tasks and fiddled with color schemes, the Android glitch stopped nagging me. Users on Google Play complain they could not find a way to draw Dependencies, so it is worth mentioning again that Dependencies are only available in a Pro version. One particular bubble will not display tasks, and I don’t know why. The main page offers a list of your projects and the options to add a new one, plus some buttons to access your user profile, account and notifications, as well as Inbox, where you can create tasks that are not assigned to any particular project, yet. Later, you can add these tasks to projects. 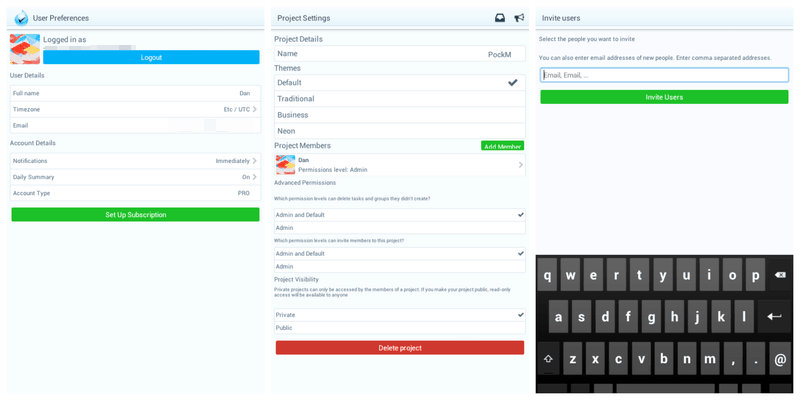 Tap on a Project, and here you will have three main tabs – visual view, project activity and project settings. 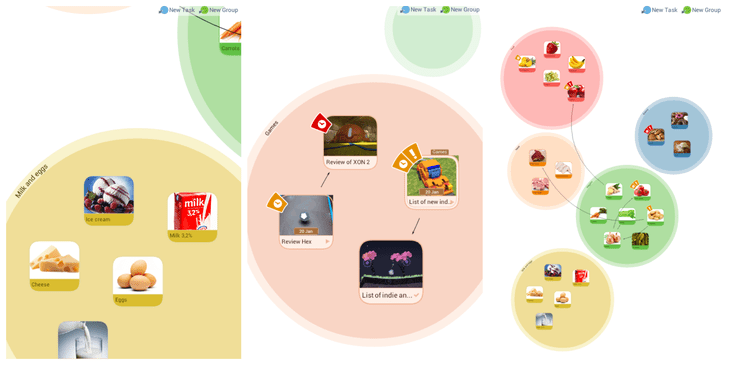 The visual view takes you the canvas with bubbles; project activity displays the timeline of changes you’ve made to the project with more tabs of comments, attachments and completed views; project settings let you edit the title, themes (Pro), add members, edit permissions and project visibility (private, public). The Delete button for the project is also in the project’s settings tab. DropTask’s website features an exhaustive list of how-to’s and FAQs that cover pretty much everything you may want to know. DropTask is a must-have for any visually-oriented user looking for a beautiful, easy-to-use, free visualization app with a decent feature set. The free app is quite enough for daily and weekly routines, shopping lists, wish lists, party and travel planning and ideas, you name it – the visual delight of colorful bubbles on a white canvas makes the cut. A free version does lack the featured images for the tasks – a feature that makes the whole picture a lot easier to digest immediately. At the same time, if you are on Wunderlist, Any.Do, To-Doist or Google Keep, you are unlikely to jump ship for something new, but it is worth a try. DropTask is a must-have for any visually-oriented user looking for a beautiful, easy-to-use, free visualization app with a decent feature set.